09-12-2018 Saudi Kuwaiti Emir Sheikh Sabah Al-Ahmad Al-Jaber Al-Sabah, Qatar's State Minister for Foreign Affairs Sultan bin Saad Al-Muraikhi, Oman's Deputy Prime Minister Fahd bin Mahmoud Al-Said, Saudi Arabian King Salman bin Abdulaziz Al Saud, Bahraini King Hamad bin Isa Al Khalifa, and Vice President and Prime Minister of the United Arab Emirates (UAE) Sheikh Mohammed bin Rashid Al Maktoum (from L to R) attend the 39th Gulf Cooperation Council (GCC) summit in Riyadh, Saudi Arabia. 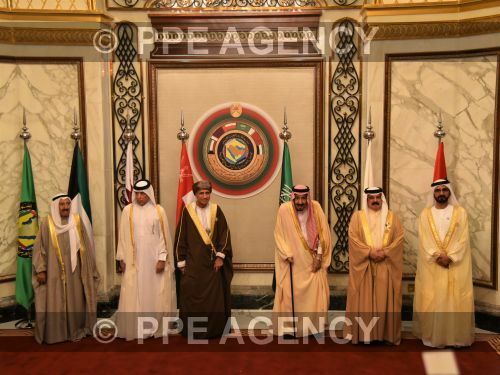 The 39th Gulf Cooperation Council (GCC) summit kicked off on Sunday in Riyadh. The one-day annual summit is expected to discuss regional and international issues to promote political, defense, economic and legislative integration and cooperation among GCC member states, Saudi Press Agency (SPA) reported.